I have always maintained being a woman is not the easiest job on earth. Well, it is not being a woman per se that is the problem here; but the responsibilities that come with it. I don't mind donning the role of mother, wife, sister and daughter etc; it's what comes with the territory that can leave me fazed. Take cooking healthy meals for example. How can that be an issue you wonder? Women all over the world have been cooking meals for their families, for centuries. True that and I don't refute it! It is a problem when you marry a man who thinks vegetarian food is cattle fodder. I'm happy cooking non-vegetarian fare for breakfast, lunch and dinner, just as much as the man of the house is content devouring it. But, I can't live with the guilt of not having served him a 'healthy' meal. Doctors, nutritionists, fitness experts, medical experts and dieticians recommend 7-8 servings of fruits and vegetables each day. However, to include these recommended portions into a non-vegetarians diet is a formidable task; and that is why I often find myself in a tight spot. I heaved a sigh of relief when my husband agreed to being served one vegetarian food item a day. But, my delight and sense of relief was short lived. I looked through cookery books and web portals on vegetarian cooking for recipes that included lots of veggies; but other than the staid mixed vegetable kormas and pulao recipes there was nothing appetizing to be found. Not one to give up easily, I took it on me to reinvent 'desi' vegetarian cuisine. I started experimenting in my kitchen and my hours of labour gave positive results. I came up with delicious vegetarian curries that use at least four vegetables; not counting onions and tomatoes. If you have a fussy eater at home then you must try some of my vegetarian recipes - they are loaded with healthy vegetables and taste scrummy. I try and incorporate as many veggies as I can into one dish so the nutrient quotient remains high. I keep my word of serving just one vegetarian dish at the table and am satisfied to bits in knowing that one dish has the power of plenty. My mission of serving healthy food is accomplished . Here I share with you a kofta curry recipe, with a twist. 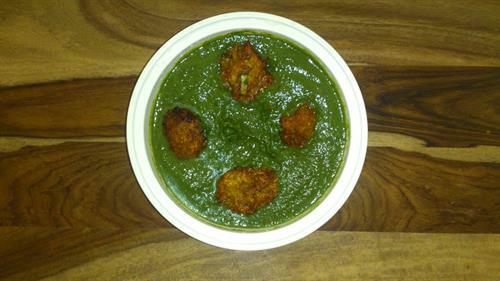 The koftas are made using bottle gourd (lauki/ghia/doodhi) , carrot (gajjar) and wholesome soya granules, plated on a thick gravy of spinach (palak) and fenugreek (methi) greens. I share three different versions of the same dish, one using just veggies, one cooked in chicken stock for a flavourful dish and one stuffed with dry fruits and nuts that can be served to guests when you throw a party. Mix all the ingredients except the oil in a large bowl, just before you want to fry them. Do not let the mixture stand for long as the veggies will start releasing excessive water because of the salt and the batter will get too watery. You can always thicken the batter by adding gram flour to it, but that will make the koftas hard, and we don't want that to happen. Shape the koftas into round balls or any shape you want. Heat oil in a kadai and when it is reasonably hot, gently slide in the koftas. Fry them on medium heat until they turn brown all over. Remove on an absorbent kitchen towel. How to prepare the palak/methi gravy? How to serve the kofta? When I entertain I believe in serving food that my guests will relish and talk about on their drive back home. Keeping this in mind I add a little twist to this kofta dish when I have people over for a meal. I stuff the koftas with slivers of almonds, raisins and paneer. This is a trick I learned from a friend of mine who is a trained chef. He told me to add chicken stock to vegetarian gravies to enhance their flavour. Since then I have always kept frozen chicken stock in the freezer. How to make chicken stock? You can use pieces of uncooked chicken that you would generally discard to make the chicken stock. If you want you can add a few veggies to the stock as its being cooked. How to use chicken stock in palak/methi gravy? Why I recommend this dish? adds a slight sweet flavour which complements the tartness of the methi. Hello mam, mouth watering recipes! Delicious and very nutritious spring onion gravy is my favorite. The preparation is very easy and simple. Clean and wash spring onions properly. Finely chop the green and white part of the onions. Chop onion, green chillies and tomatoes. Take a pan and heat oil. Fry mustard seeds and then add white part of spring onion, fry for 2 minutes. Add chopped onion and fry till onion becomes brown in color. Now add one tsp of ginger garlic paste in the pan and fry for a minute. Add finely chopped green chilis, tomatoes, salt and cook till the tomatoes become tender. Mix chili powder, coriander powder, and turmeric and garam masala powder in the mixture. Put little water and cook for 3-4 minutes. Now it’s time to add chopped green part of spring onion and cook for 5 minutes. Add little water and cook the curry for 5 minutes. Serve hot with chapatti, nan or puri. Thank you for sharing the recipe Mathi. This was my favourite when I was a kid. My mother cooked this only when she was very busy or got home late from school. Do you have any recipes that include at least 4 vegetables, apart from onions, tomatoes, ginger and garlic. My aim in posting this recipe was to show readers that we can provide nutrition through one dish by adding different veggies to it. This way we get benefits of a variety of veggies by eating one dish.